Pike’s Place, Seattle’s renowned farmer’s market, underscores this city’s love of fine and fresh food. You’ll discover that Seattle is home to more than its share of excellent cooking schools. Your biggest decision will be how to choose one from the other. 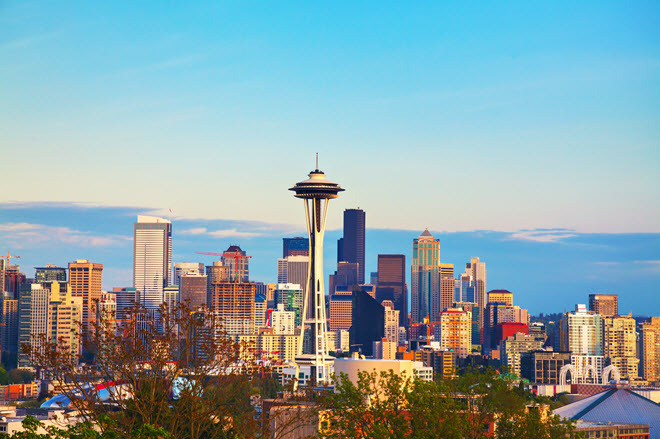 Seattle’s proximity to some of the most fertile ground in the country means fresh, fresh, and more fresh. Many of the nicest restaurants and well-known chefs create menus that change with the bounty of the seasons. The wine industry is also alive and kicking. Washington’s Columbia Valley is home to over 550 wineries*, many of which are earning top awards for viticulture. Overall, organic, vegan and environmentally conscious culinary methods figure prominently in the Pacific Northwest. Don’t forget that much of the bounty also comes from the sea: dungeness crab is a local menu staple. The Space Needle, Mount St. Helens and Mt Rainier—these punctuate the skyline in and around Seattle, framing the culture and cuisine. This city is accessible by foot and public transit and you can easily escape to nature when you need a work and study break or simply some natural inspiration for your new dishes. Seattle is the newest addition to this Sacramento based culinary arts program. Kitchen Academy focuses on today’s demanding culinary world and the need for next generation chefs equipped with a diverse array of culinary, business and management savvy. This intensive program was designed with the help of professional chefs and emphasizes work as learning methodology. You can earn a Professional in Culinary Arts Diploma and study during the day or in evening programs. This innovative program is offered through the Seattle Central Community College, proof that a top-notch cooking school doesn’t have to be tethered to France. Earn an Associates of Science in Culinary Arts or an Associates of Science in Specialty Desserts and Breads. This hands-on program puts you to work in the schools’ own restaurants: Square One Bistro, One World Dining, and Chef’s Express. One of the most popular culinary arts programs in the country, the AI programs turn out award-winning chefs over and over again. Curriculum is designed to meet the needs of full-time and part-time students. Degree programs are available for pre-professional chefs, restaurant managers and other food service pros.